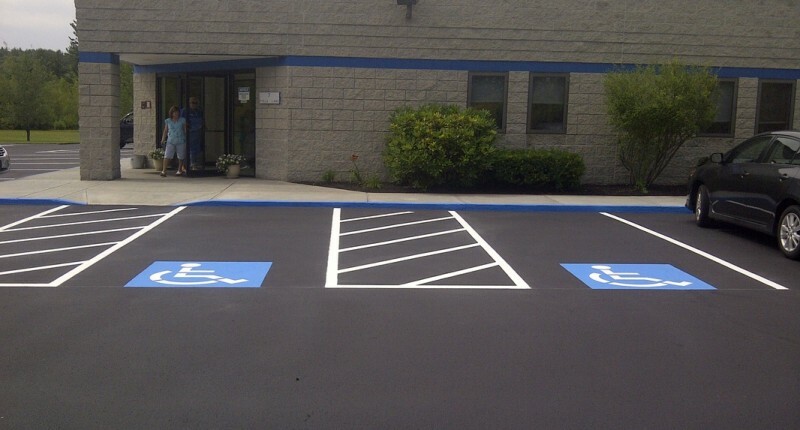 White Wolf Striping is a parking lot pavement marking NH company, specializing in lots of all sizes. Our reputation of providing the best quality service and attention to detail has given our clients the confidence that their project will be done correctly. You can depend on us for professional service and quality work with a competitive price. Professional line striping assists your visitors-employees in the safe use of your business parking lot. It directs traffic to the correct entrance and exit. Both parking and handicap accessible spaces. Crosswalks, fire lanes, and loading zones. A properly designed parking lot maximizes the number of cars you can safely accommodate, as well as improving the aesthetics of your business. A parking lot is the first impression of your business to visitors on arrival. With our experience in layout and design, combined with quality work as well as professional service. We are the company that many trust and have chosen to get their project completed. Maintaining your parking lot striping will greatly improve the overall appearance of your business as first impressions are important. Many business owners use this very inexpensive option to get an instant aesthetics boost and show your customers you care. Also maximizes the lots capacity. These benefits can help ensure a good parking experience for all. 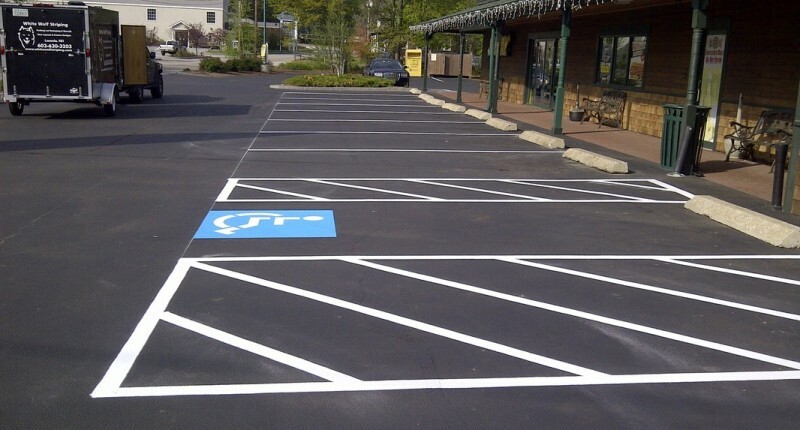 A parking lot with clear and bright markings will decrease the possibilities of accidents, and the liability of the property owner. Pavement markings that are not visible to drivers will create larger or smaller than needed gaps between vehicles resulting in less capacity of the lot and potential damage to vehicles. When done correctly it can really give your lot a professional new look. When done incorrectly it can have a negative impact. White Wolf Striping is the choice for completing the job with quality and efficiency at a competitive price. The straight in design (90°) always allows for the most parking spaces with two way traffic. In some instances angled stalls (45°, 60° or 75°) can be the only option. Angled stalls can be easier for drivers to turn into and back out of and require a narrower driving lane. Angled stalls provide a controlled one way traffic flow, but will use more square feet of the parking lot. Signed into law in July 1990, the Americans with Disabilities Act (ADA). Regardless of the company size, all businesses must now have the proper amount of handicapped accessible parking spaces, and required van parking spaces. Most newly constructed parking lots for commercial and large residential properties to be striped to the ADA requirements before an operating permit is issued. 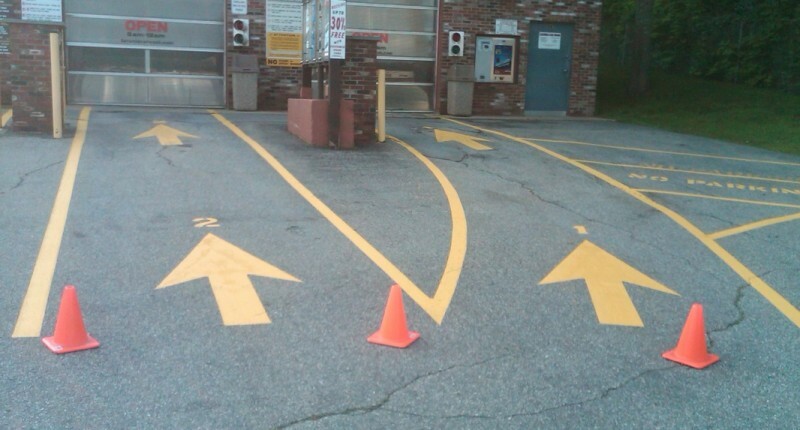 * Block off the parking lot or sections of with traffic cones. * Clean the lot of all debris with a power blower. * Layout parking lot with auto-layout system by using chalk and a string line for straight professional looking results. * Stripe a new layout to the site plan specifications or re-stripe the existing design. Ask about our pavement marking NH annual service which offers the best value for your business. Serving the Lakes Region and all of NH. Call us anytime at 603-630-3203 for a free estimate. Please complete the information below and click submit button at the bottom. We always a contact our customers within 24 hours, 7 days a week.